1. Cut the halloumi into 12 cubes and thread onto 4 metal skewers, alternating with the Mediterranean vegetables. Brush each one with 1tsp of pesto. 2. Griddle or grill the skewers on a hot, preheated barbecue for 10-12 minutes, turning occasionally, until colour begins to appear on the edges. 3. 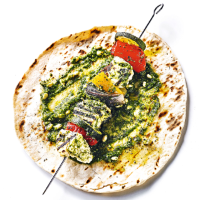 Warm the flatbreads on the barbecue, then spread or swirl the remaining pesto on top. Top with the skewers to serve, or remove the skewer and roll up or fold the flatbreads in half.